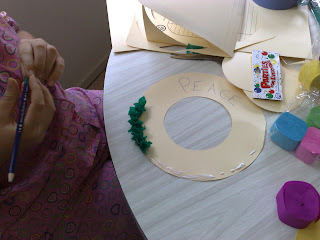 Today to keep our hands from scratching we started making our Christmas crafts and what better way to start than with the wreath. 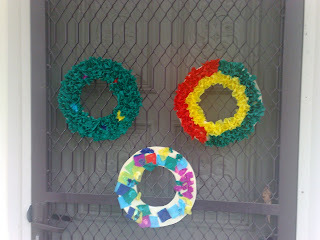 I had bought some colour streamers which we cut into little square/rectangle pieces. We them cut a donut out of a manilla folder. Puting some PVA glue down the kids then took a piece of streamer wrapped it around the end of a pen and glued in on the manilla donut.This gives it a flat bit to stick to the glue and the folded up edges bush out. I would start in the centre circle and work my way out next time. 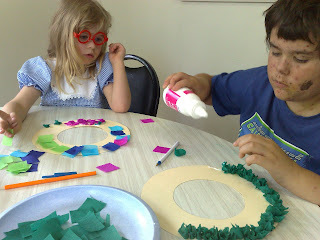 Miss E who is only 4 found it easier just to glue and stick. No she does not have glasses now, they came in a doctor set she bought, so is wearing them everywhere. Once completed and dried, I just taped some string on the the back and tied them to the front door. Miss Z is the nearly completely green one, Master J did the red, green and yellow. Miss E the multi colour ring.